More and more airports include many dogs and their owners heading off to exotic destinations around the world. Every year, millions of pets fly the friendly skies. Dogs are routinely cruising, relaxing, hiking and exploring with their owners rather than staying behind at a shelter or doggie day care. Putting together a packing list for your pet is essential when traveling with your pet on holiday. However, it is also important to make sure your dog’s style reflects the destination they are traveling too. That means new travel clothes for your dog! Not only are stylish dog clothes a way to attract attention for your well deserving dog, but they can be very practical depending on your destination. Not all dogs are candidates for doggie clothing, but even a new collar or leash can make a statement when your pet arrives at their pet-friendly cottage or resort. Even a simple bandana or hair accessories can make your pup feel special as you relax on warm beaches, hike difficult trails, or cruise the high seas together. Unless you own a Husky or another dog bred for cold weather, your dog will need a warm dog coat when traveling to a cold climate. If your dog has short hair, the are more susceptible to the cold, just like you. If you own a dog that gets chilly, the #1 brand is Weatherbeeta. Weatherbeeta is known for keeping having the best horse blankets around. They also have a line specifically made for dogs that promise the same quality. The coats come in various styles, and weights accommodated any climate. 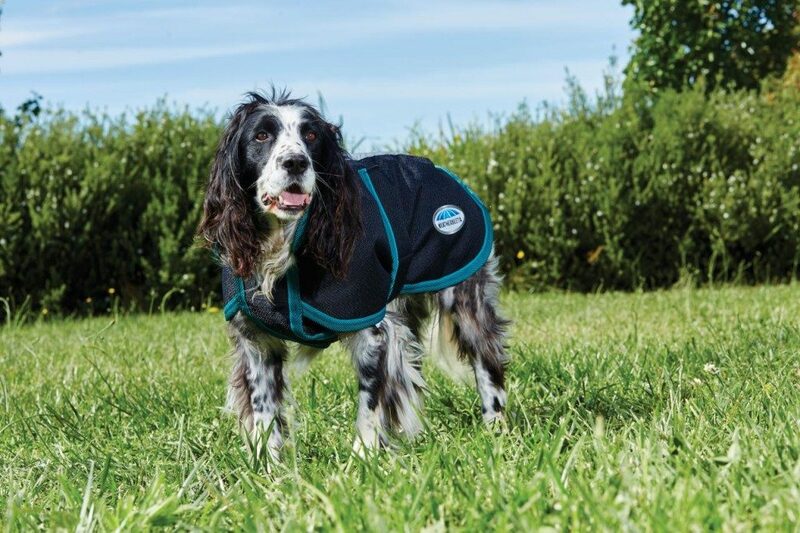 Most of the coats are waterproof and have large belly bands to keep your dog’s belly nice and warm. See their complete line at Weaterbeeta.com. 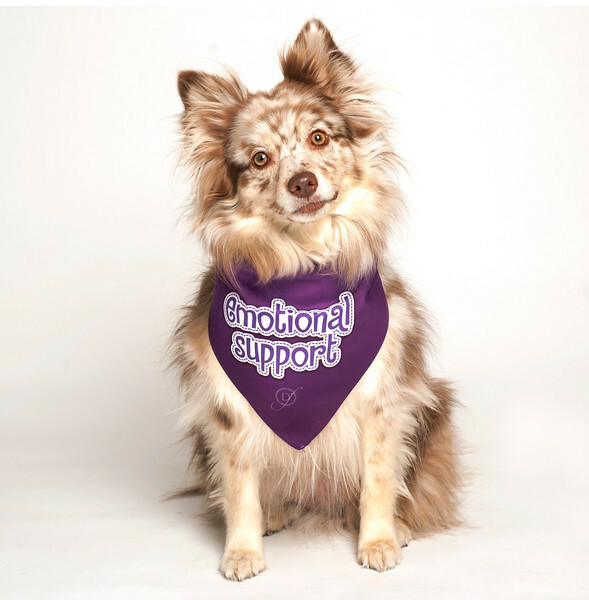 The Dog Fashion Living Emotional Support Dog Bandana is a perfect accessory for your dog during travel. If you are traveling to a tropical climate, it’s smart to invest in a protective shirt designed for dogs. Skin cancer in dogs is prevalent, especially dogs with white skin. It is no surprise that the most frequent cause is sun exposure. Sun shirts for dogs look like traditional rash guards worn by humans and are ideal for a day at the beach. As the sun reflects off the waves and sand, sunburn in dogs in more common that you think. For pets with extensive fur loss or a history of skin cancer, these sun protection shirts are a must. 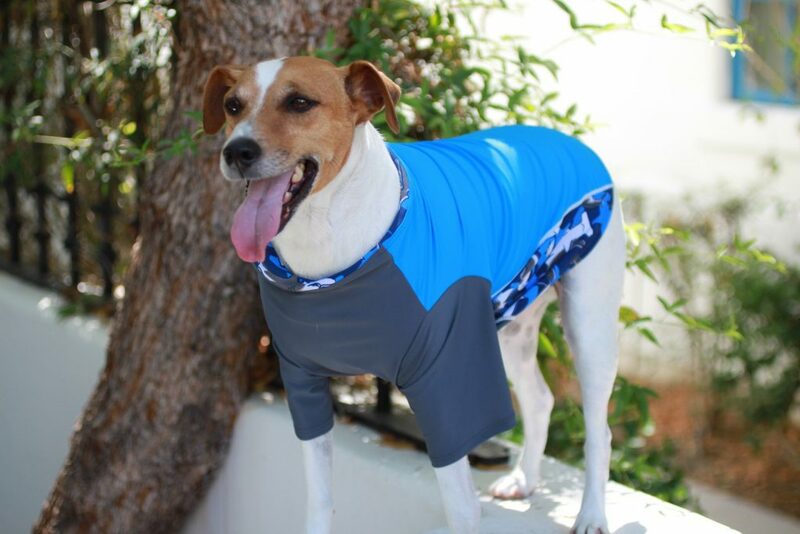 Playa Pup Rash Guards are fashionable, lightweight sun protective dog shirts. The UPF 50+ fabrics provide maximum sun protection against UVA/UVB rays, wet or dry. It is important to keep your dog warm and trendy when traveling. Not all stylish doggie sweaters need to be Argyle. Many modern owners seek unique dog sweaters that will keep their dogs toasty when shopping and dining in locations throughout the UK and America. This cashmere sweater by 360 Cashmere is perfect for those dogs who like to live on the edge and dream about rock and roll rather than classical music. 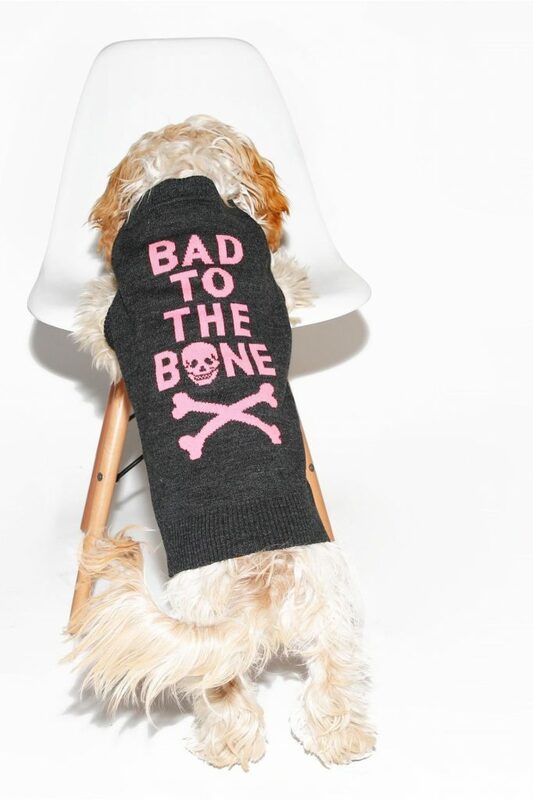 This sweater, made for your ‘lil troublemaker, features a ‘Bad to the Bone’ and skull and crossbones intarsia. It is sure to attract a lot of attention and stand out from the other dog on holiday. Last but not least is a reflective dog collar. Reflective dog collars are always a good idea, but especially useful on holiday. They come in handy when you and your dog are walking around in the evening hours enjoying the local nightlife. If your dog were to get off leash, reflective collars could be especially useful to help you find your dog as you navigate a stressful situation in a foreign city or town. The dog collars from if it barks are fully customizable and can be ordered to match the colors of the flag where you are traveling. If you are going to Italy, you can easily customize your dog’s collar to be green, white and red. 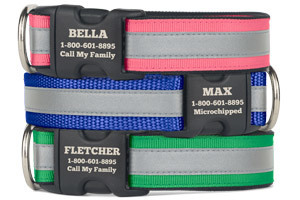 The collars can be personalized with the dog’s name, contact information and the hotel or cottage you are staying. 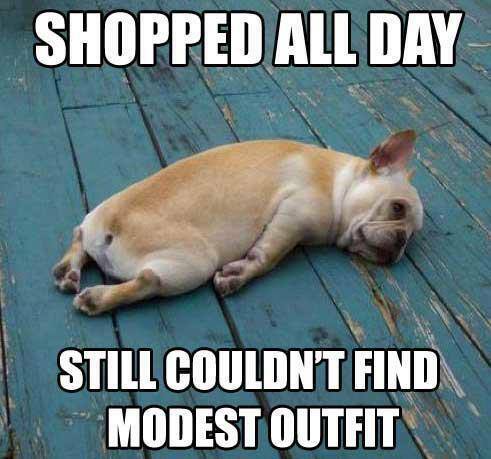 There is no harm putting clothes on your dog whether it is for fashion or function. What is important is that your dog is wearing clothes that are appropriate for the destination they are visiting. 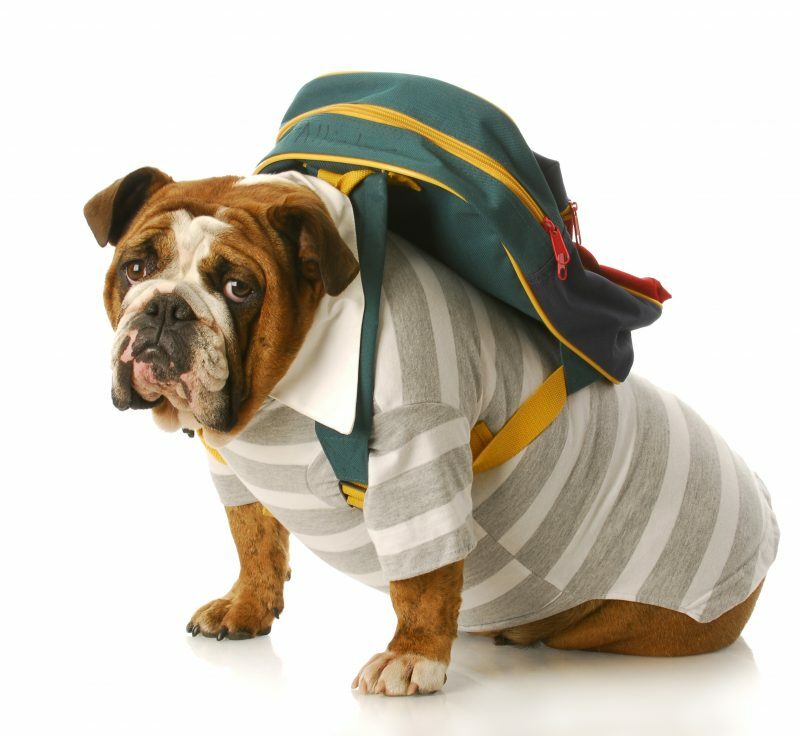 Properly measure your dog before ordering any clothes or accessories, so your dog is comfortable at all times. You want to make sure that your dog cannot easily pull the piece off. If it drags on the ground or gets caught on anything during movement, your dog may get scared or injured. You want the piece to be snug without being tight. If you found this article useful, please SHARE it with others who are interested in finding unique and practical travel clothes for their dog!